Thirty-eight years ago in our galaxy, a force changed moviedom forever. STAR WARS (which later became STAR WARS: EPISODE IV – A NEW HOPE) was watched by millions all over the world, went on to win 38 awards (including seven Oscars) and etched the characters of Luke Skywalker, Darth Vader, R2D2 and others into the collective consciousness of that generation and others to come. Even with the failures of Episodes I, II and III (and we’d all like to forget those films), STAR WARS still holds a cherished place in the hearts of many. There was concern amongst the fanboys and fangirls, though, that when the Walt Disney Company purchased Lucasfilm in 2012, the newest batch of episodes would be somehow be “Disneyfied”. Would Princess Leia now wear a colourful ball gown with a tiara? Would the Stormtroopers break into song and dance? Would every character and every prop be pimped out as a Christmas toy? Now that the first of three new films is out, we know the answers to these pressing questions. The Disney execs have pretty much kept their paws off this project, although there are 71 official Star Wars-branded items available for purchase from their webstore. To be fair, though, even if Disney weren’t involved, there’d still be the merchandising connection. That’s the galaxy we live in today. The good news for fans young and old is that Episode VII (or STAR WARS: TFA, as it’s now being referred to by the series faithful) is a winner. Written by Emmy winner J.J. Abrams (TV’s LOST), who also directed, Lawrence Kasdan (who also wrote the screenplays for Episodes V and VI) and Oscar winner Michael Arndt (LITTLE MISS SUNSHINE), TFA captures the excitement, the scale, the wonder and the humour of Episodes IV, V and VI. Most of our beloved characters are back – Luke (Mark Hamill), Leia (Carrie Fisher), Han (Harrison Ford), Chewbacca (Richard Mayhew), C-3PO (Anthony Daniels) and R2D2 – and, although they’ve aged almost four decades, they’re as feisty as ever. Don’t expect to be seeing Obi-Wan, Yoda or Darth in this series though. Those characters are all dead (that’s not a spoiler! ), and Alec Guinness passed away in 2000. Lando isn’t around either, though actor Billy Dee Williams has said that he’ll probably be in future episodes. THE FORCE AWAKENS is set approximately 30 years after RETURN OF THE JEDI (aka Episode VI). 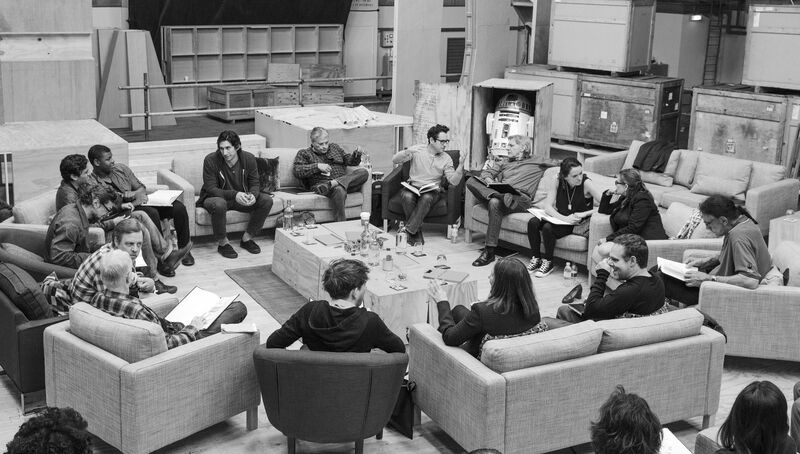 The film quickly introduces us to a new set of characters – Rey (Daisy Ridley), a scavenger on the planet Jakku; Finn (John Boyega), a former Stormtrooper for the First Order; Poe Dameron (Oscar Isaac, INSIDE LLEWYN DAVIS and A MOST VIOLENT YEAR), an X-Wing fighter pilot for the Resistance; and BB-8, his spherical droid. Luke Skywalker, the last Jedi, has disappeared, and the First Order, which has risen out of the ashes of the Galactic Empire, is out to find and kill Luke, and crush any resistance put up by the New Republic. Basically, 30 years of peace and tranquility is about to come to an end. Ridley and Boyega had huge shoes to fill in their lead roles, which was probably made more difficult by having the owners of those shoes standing right next to them during the production. Fortunately, they do a great job portraying Rey and Finn as strong and highly likeable (and highly marketable) characters. If anything, they are better than Fisher and Hamill were when they started down this road. Boyega is poised to become a series favourite. Like Ford, he is perfect at throwing out well-timed one-liners that lighten the mood when all hell is breaking loose around him. There is no denying that seeing the old group together on the big screen is a huge, nostalgic treat. The first time my audience saw Han and Chewie, there was a noticeable “awww” rippling through the room. We were reuniting with long-lost friends. The screenwriters could have given them cameos in this film but instead pressed them firmly into service. Han and Chewie quickly find themselves in the thick of things, fighting off First Order forces. For Han, he has more at stake than just getting his Millennium Falcon back. For Chewie, of course, he goes where Han goes because he’s loyal to the core. As far as special effects go, TFA is not groundbreaking by any means. I remember when I saw Episode IV at the long-gone University Theatre in Toronto, I was blown away by the special effects. Today, we laugh at its primitiveness. TFA doesn’t show us anything we haven’t seen before, either in previous STAR WARS films or in any Christopher Nolan or Michael Bay film, for example. But that’s okay because the action is fast, the pacing is slick and the performances are solid. If there are any weaknesses with the film it’s that the story is a bit too similar to Episode IV (perhaps intentionally so) and crises get resolved far too conveniently. I’d be specific but that would be revealing too much. But don’t let that stop you from seeing it. It’s still good entertainment… for all generations.